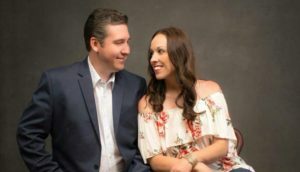 The Darin & Brooke Aldridge band has been developing in Darin’s imagination since the idea of forming his own band emerged shortly after he joined his first band Straight & Narrow in his early teens. It was there he switched from banjo to mandolin before joining his first touring band Acoustic Syndicate, a folk/rock/bluegrass band still on the road. Shortly thereafter, he was asked to join The Country Gentlemen (1999-2005), playing mandolin and singing harmony. This version of The Gents provided Darin with a set of road tools and management skills that still work for him in his much wider and more comprehensive efforts. Much of Darin Aldridge’s story harkens back to his family’s home in Avery County in rural northwestern North Carolina, adjacent to the Tennessee border. His parents moved to Gaston County to be near his dad’s base as a truck driver. Darin was born there in 1977, surrounded by music in a culture dominated by farming and the dying mill culture of the Carolina Piedmont. For many musicians growing up in the area just west of Charlotte, N.C., a mysterious cinderblock building hidden away in Darin’s hometown of Cherryville became the crucial locale for their introduction to bluegrass music. Owned by local entrepreneur and civic-minded music lovers Jack and Judy Bingham, the Bomb Shelter hosts a large and enthusiastic weekly jam inside in winter or a few steps away at an outdoor stage, cabin, and bonfire. There, Darin met and became friends with local music legends, musicians who hired him to tour, and the late Dr. Bobby Jones, also known as Dr. Tom Bibey. Dr. B was an avid golfer, a fine mandolin player, and a community leader who spent more than 25 years playing in a band with Horace Scruggs. Dr. Bobby became an important mentor in Darin’s life at a point where he found himself in need of guidance and direction. Darin continues to show up at the Bomb Shelter when he’s in town, to pick for fun and to keep an eye on his former students who now are making their way in music. Darin maintains his studio in the basement of his mother’s home in Cherryville, where he teaches on most afternoons and makes sure all is well, as she lives alone. While on the road and around town, he is constantly on his phone, checking in with family and friends. With The Gents, Darin also worked closely with Charlie Waller, whose declining health required attention. After Charlie’s passing, Randy Waller left to form his own version of The Country Gentlemen, whose name he owned, while most of the members of the last contingent went off to create The Circuit Riders, who made one recording and toured for a while before going their separate ways. Part of this band became core members of the first band that Darin created, soon after beginning his relationship with Brooke Justice, a recent graduate of Appalachian State where she had majored in Elementary Education. I first met Brooke at the Bomb Shelter, where she was sporting a new engagement ring. In the ensuing years, her voice has become recognized as one of the finest and most recognizable in bluegrass. She was named 2017 IBMA Female Vocalist of the Year. Brooke grew up in Avery County, N.C., a deeply rural, sparsely populated county of high mountains with few roads and only one high school and where Darin’s family had also originated. She grew up in a staunchly Baptist community where she was baptized one January in a freezing creek behind the local church, the home of her earliest singing. “Music was intertwined in my family, so it came naturally to me,” Brooke says. “My parents encouraged me at an early age.” They had recognized her eagerness to sing and how quickly she remembered the lyrics of songs. The savings bonds she received for finishing in the top three in singing contests locally and regionally were dedicated to create a college fund. Brooke believes she was called to sing, and the over thirty competitions she won helped confirm this conviction. Because she played sports, as well, she was often asked to sing the national anthem before events or to sing on the bus riding to and from games. What started as a warm friendship with singing together in each other’s bands soon blossomed into something more. Combining their faith, talent, and ambition worked, leading to their becoming engaged at SPBGMA three years later in 2008, and marrying later that year. At almost the same time, The Circuit Riders began to go their separate ways, leaving a perfect setting for Darin to begin fulfilling his musical vision as he formed the first iteration of the Darin & Brooke Aldridge band. The first version of the Darin & Brooke Aldridge band was formed, and they released their first CD of all gospel tunes in 2008, quickly following it with a more wide-ranging recording of their most requested songs. Early on, they decided that their brand would always proclaim their roots in faith while avoiding some of the traditional bluegrass subject matter such as cheating songs, murder ballads, and drinking. While their music has become increasingly broad and far-reaching, they’ve remained true to their earliest commitments, offering uplifting songs of hope, aspiration, and love. The current version of the band began to take shape as The Circuit Riders drifted off in their own directions, although early bass player Billy Gee has now returned. Darin has expanded the band’s range and capabilities. He has often replaced single instrument musicians with multi-instrumentalists capable of blending with his guitar, mandolin, his harmony, and Brooke’s strong reliable voice. There are always times when players leave for their own reasons—marriage, a more reliable job, too much travel, or a desire to remain closer to home and roots. Becky Buller came through the band for a period, before developing her own successful band. Dwayne Anderson left the bass position for marriage and a full-time job at King College. Rachel Johnson, whose chemistry with Brooke was delightful, left to become Rachel Johnson Boyd and a proud mother. With each personnel move, Darin was able to strengthen the mix. Matt Menefee, former member of Cadillac Sky, plays one of the most versatile and subtle banjos in the business, while also filling in on guitar when necessary. The remarkable young fiddler, Carley Arrowood, was soon added to the band, bringing another harmony voice to the mix. Arrowood was selected as one of four Instrumentalists Of The Year to receive a Momentum Award at the 2017 IBMA Special Awards Banquet. Brooke’s instrumental contribution has expanded to rhythm guitar, which she adds to her steady mandolin chop and that voice that comes out of a deep well of power and quality. It’s a voice easily recognizable, yet subtle enough to fit in with almost any other singer, male or female. Darin has taught music to people who wish to play bluegrass instruments. Despite not being noted as a banjo player, he is nevertheless a fine picker. He provides instruction in mandolin, banjo, and guitar. At small local festivals, he finds time to showcase his students of all ages. He also often meets his students at The Bomb Shelter and introduces them to jamming. On these evenings, he also picks with local players who began as his friends and mentors, many of whom he has now surpassed in skill and notoriety. For ten years, he’s met weekly with a regular jam at the Gaston School of the Arts, where he also takes his students. Through his own young life, Darin always found others who took an interest in his musical development, and he’s carried this forward in his own way. He was named 2010 Citizen Of The Year in his home town of Cherryville. Nearby Shelby, N.C., is Cleveland County where Earl Scruggs was born, worked in the local mills, and created a new way to play the banjo. For years, as the economy of North Carolina’s mill-based industries deteriorated, the people of Cleveland County envisioned the handsome, but then unused County Courthouse on the town square as the home of a museum devoted to the life and career of Scruggs. Darin’s mentor, Dr. Bobby Jones, was one of the principal boosters of this project, as Darin became active, too. Meanwhile, major artists have chosen Darin and Brooke with their band to back up and feature in their shows. Because their singing blends so well with a variety of voices and styles, and their band shows such instrumental versatility, they are able to complement singers who’ve been major voices in American music for two generations. John Cowan, whose emotional sincerity and explosive voice animated the sound of the historic New Grass Revival, first heard Darin and Brooke in Nashville at Music City Roots. Remembering Darin from his performance with Acoustic Syndicate, Cowan invited them onstage for a song when they were both playing in Hickory, N.C. Darin says, “Brooke singing and me and John singing harmony just worked, so we got to doing some shows, which worked into what we’re doing now.” They now play together when John is on hiatus from the Doobie Brothers. Jimmy Fortune, lead singer with the Statler Brothers for 21 years, has also joined together with Darin & Brooke on several tours which have drawn audiences and attention. Their most recent CD, Faster & Farther, hit #1 on the Bluegrass Unlimitedchart, as well as the Roots Musicbluegrass chart, staying in the top ten for over four months. Meanwhile, the Ian & Sylvia song “Someday Soon” hit #1 twice on theBluegrass Todaychart, where three other songs from the album also charted. The album debuted at #7 on the Billboardbluegrass chart, remaining there for ten weeks. No Depressionpicked Faster & Fartheras one of the Top Albums of 2017. This all demonstrates strong acceptance in bluegrass as well as other genres. Brooke was IBMA’s Female Vocalist Of The Year in 2017. Darin won the Mentor Award at the IBMA Special Awards banquet earlier the same day. They look forward to the remainder of 2018 and in to a bright and, as Vince Gill says, unlimited future in and beyond bluegrass music. Meanwhile, the duo is headed for the Czech Republic this winter and making two additional trips abroad during the summer to Ireland and later to France. Darin & Brooke Aldridge are clearly music stars, a well-deserved reward for two people who have worked hard, kept their careers, faith, and lives in perspective, and provided a model of quality performances and personal integrity.